She pours fire and fury into powerful songs that target everything from police shootings to slavery. The musician reveals all about her mission to put the black back into bluegrass – and Shakespeare. As someone on a mission to bridge such divides, Giddens thinks about this stuff a lot. The Grammy-winning singer and songwriter was born to a white father and a black mother in Greensboro, North Carolina, in the late 1970s. Her parents married only three years after the landmark Loving v Virginia decision, which reversed the anti-miscegenation laws that had made interracial marriage illegal. Their union was still shocking enough that her father was disinherited. Other songs span various aspects of African American history, from the civil rights era to Black Lives Matter, while revealing the breadth of her musical influences. Soul, blues, gospel, jazz, zydeco – her versatile voice wraps itself around them all. It also proves a wonderful counterpoint to her nephew Justin Harrington’s rap on the funky Better Get it Right the First Time, a song she wrote in response to police violence (“Did you stand your ground / is that why they took you down?”). The lyrics came tragically close to home when she performed it in Dallas just a few days after the shooting of 15-year-old Texan Jordan Edwards, who, like the song’s protagonist, was a bright young student shot dead as he left a party with friends. Giddens has become known for her brave and articulate works and words. Her group the Carolina Chocolate Drops, in which she plays banjo and fiddle, won a Grammy for their inspired revival of black string-band music, while her combination of musicianship and musical activism has earned her multiple prizes, including comedian Steve Martin’s Award for Excellence in Banjo. In 2015, Giddens’ solo album Tomorrow Is My Turn introduced her powerful voice – she trained as an opera singer – to a mainstream audience. That album included only one original song, Angel City, but its compilation of covers showcased her virtuosity. Intimate renditions of folk ballads sat alongside brassy, Broadway belts; and there too, Giddens made a point of recognising forgotten female artists such as Geeshie Wiley and Elizabeth Cotten. It earned her the BBC Folk award for singer of the year. Counter culture … Giddens at the Freedom for All gala, New York, in 2016. We meet less than 24 hours after she has landed at Shannon airport. “That is why it’s such a mess,” she says, waving at the firetruck and other toys on the living room floor. The belief in music as a space where people can set aside their differences is sacred to Giddens. The MacArthur grant has allowed her to continue to tell the stories that inspire her – in particular, to reclaim narratives and restore voices to the ignored or silenced. She particularly enjoys collaborations. One recent project came about when choreographer Paul Vasterling, the CEO of Nashville Ballet, introduced her to the poems of Caroline Randall Williams, whose works explore the theory that Shakespeare’s dark lady sonnets were written about a black madam in London. 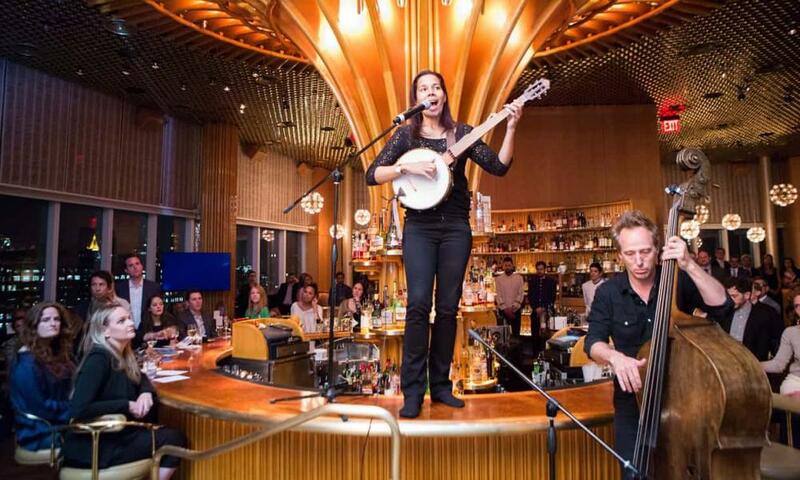 Rhiannon Giddens, and banjo, performing at the Boston Pops Fireworks Spectacular this month. Perhaps the most exciting prospect, though, is a musical that will tell the story of the 1898 Wilmington Massacre, when white supremacists in North Carolina murdered the town’s black elected leaders in what Giddens describes as “the only successful coup d’etat on American soil”. It’s a project she is passionate about, and she has enlisted the help of Dirk Powell, her songwriting partner on Freedom Highway. Finding financial backing for the project, which won’t be finished before 2020, will be half the struggle, she admits. 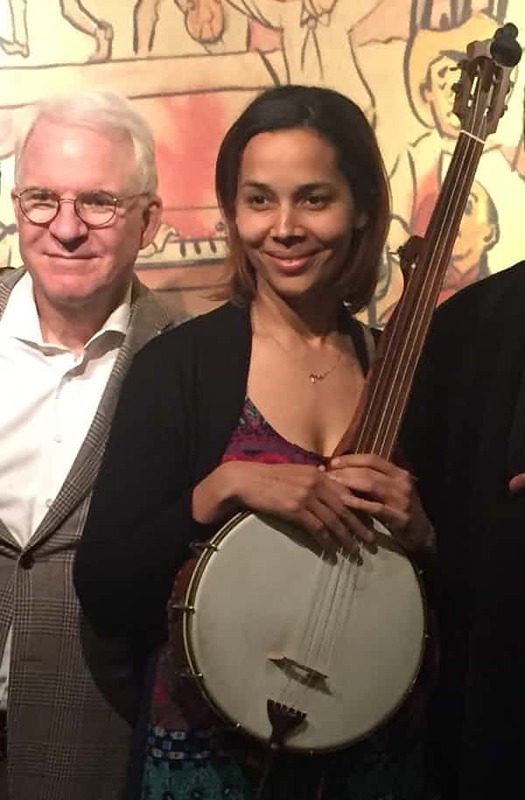 Funny turn … Giddens with Steve Martin, after winning his Award for Excellence in Banjo. 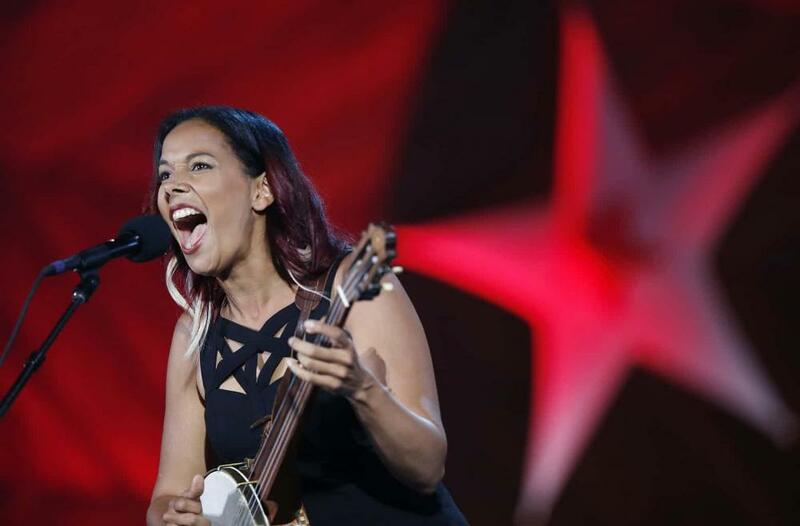 Rhiannon Giddens is the guest curator of the Cambridge folk festival, 2-5 August.